Depression is a common co-morbidity in patients with heart failure. Eye movement desensitization and reprocessing (EMDR) has been identified as an effective intervention for severe psychological distress. The purpose of this study was to examine the effect of an EMDR intervention on depressive symptoms, health-related quality of life, and heart rate variability (HRV) in patients with heart failure. 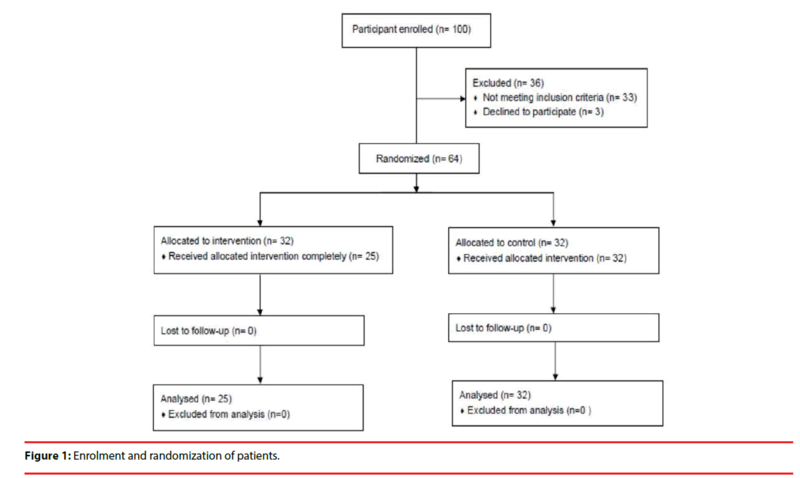 For this longitudinal experimental study, 57 consecutive patients were randomly assigned to an experimental (n = 25, EMDR intervention) or control (n = 32, routine care) group through blocked randomization. Data were collected at four times (pre-intervention, postintervention, and one-month and three-month follow-up) and analyzed with the generalized estimating equation approach. Most participants were male (57.9%), with a mean age of 63.14 ± 14.53 years and mean ejection fraction of 49.86 ± 15.18%. The majority of them were NYHA class II (n = 41, 71.9%) with a clinical history of hypertension (n = 38, 66.7%). Participants receiving the EMDR intervention showed significantly greater improvement in depressive symptoms (p < 0.001), health-related quality of life (p = 0.007), and High Frequency (HF) (p = 0.003), Low Frequency (LF) (p < 0.001), and LF/HF ratio (p = 0.001) in HRV at post-intervention compare with controls. Furthermore, the intervention effects were sustained at one month and three months after completion of the intervention. The EMDR intervention may improve depressive symptoms, health-related quality of life, and HRV in patients with heart failure. The improvements can be maintained three months later. Heart failure, a complicated clinical syndrome caused by cardiac dysfunction, is a worldwide public health issue. More than 5.8 million people are living with heart failure, and over 550,000 new cases are diagnosed each year in the United States . In Japan, it is estimated that 1.0 million people have heart failure and the prevalence of outpatients with left ventricular (LV) dysfunction will be 1.3 million by 2030. In China’s estimation, there are 500,000 new cases of heart failure diagnosed every year . Although there is a trend in decreased heart failure related mortality, approximately one million heart failure-related hospitalizations occur and the rate of readmission is rising . The various symptoms and recurrent hospitalizations constitute a severe burden on heart failure patients, and depression is a common co-morbidity. Indeed, a metaanalysis of 27 studies indicates the prevalence of depression in heart failure patients ranges from 11% to 35% for outpatients and from 35% to 70% for inpatients . A recent report from Germany found the incidence rate of depression in heart failure patients was 129 new cases in 1000 person-years, and recurrence rate was 37 cases per 1000 person-years . Depression may correlate with a poor prognosis for patients with heart failure . Research findings showed that heart failure patients with higher levels of depression were more likely to die compared with those who had no depressive symptoms [6-12] , and heart failure patients with more depressive symptoms had higher rehospitalization rates [7,10,12,13]. The interaction between depression and heart failure may involve several factors. Depressed patients tend to have a low compliance with medication treatment, and poorer quality of life (QoL). For instance, a study of 252 heart failure patients in the United States showed greater levels of depression were negatively related to treatment adherence, and associated with lower self-efficacy after adjusting for the standard set of covariates . Three studies found a negative relationship between depression and QoL. One study conducted in community (N = 702) revealed that systolic heart failure patients with depression had poor QoL . In a secondary data analysis of a randomized controlled trial (N = 2322) investigating effects of exercise training in patients with heart failure found a negative association between depression and QoL . Another cross-sectional cohort study (N=146) identified a negative relationship between depression and QoL in patients with advanced heart failure as well . Heart failure patients with depressive symptoms had poor QoL. Moreover, depression may cause an imbalance between sympathetic and parasympathetic regulation of the autonomic system, which is associated with a reduction of HRV [18,19]. A cross-sectional study of 44 patients with implantable cardioverter defibrillators showed that patients with higher depression levels had significantly lower root mean square of successive differences (rMSSD) and percentage of successive normal sinus intervals > 50 ms (pNN50) compared to patients with lower depression levels after adjusting for covariates . Similarly, among 91 outpatients with heart failure, those with greater depressive symptoms had significantly lower standard deviation of the normal-to-normal intervals (SDNN) than those with less depressive symptoms patients . Decreased HRV may arouse cardiac arrhythmia and cause sudden cardiac death in patients with heart failure [19,22]. Eye movement desensitization and reprocessing (EMDR) is a form of integrative psychotherapy developed by Francine Shapiro. The hypothesis for EMDR is that eye movements in a rhythmic left-right pattern result in bilateral stimulation . The bilateral stimulation has been found in several studies to assist with information processing by changing the nature of memories and decreasing their associated distress . EMDR has been shown to be an effective intervention for patients with anxiety disorder, posttraumatic-stress disorder (PTSD), and depression [25-29]. A meta-analysis of 26 randomized controlled trials revealed that the EMDR treatments significantly decreased the symptoms of PTSD, depression, anxiety, and subjective distress . Two studies also identified the effectiveness of EMDR on reducing the symptoms of depression in adolescent  and patients with myocardial infarction . EMDR can also have psychosomatic effects; one study found that EMDR intervention significantly increased rMSSD , and another showed EMDR decreased the ratio between the low and high frequency components of heart rate power spectrum (LF/HF) , both of which indicate an increase in parasympathetic tone. There is no consistent evidence supporting the effect of the intervention on decreasing depressive symptoms in patients with heart failure . Therefore, the aim of this study was to examine the effectiveness of EMDR on decreasing depressive symptoms, and improving QoL and HRV in patients with heart failure. Our primary hypothesis was that patients in the EMDR intervention group would show greater improvement in depressive symptoms and QoL. The secondary hypothesis was that the EMDR intervention would improve patients’ HRV. A longitudinal experimental design study examined the effectiveness of EMDR on reducing depressive symptoms, and improving QoL and HRV in patients with heart failure. Randomized block design determined assignment of participants to either an experimental group (EMDR intervention, IG) or a control group (routine care, CG). A randomization list in which the details of patients remained unknown to investigators was prepared. The participants were block randomized in blocks of four. 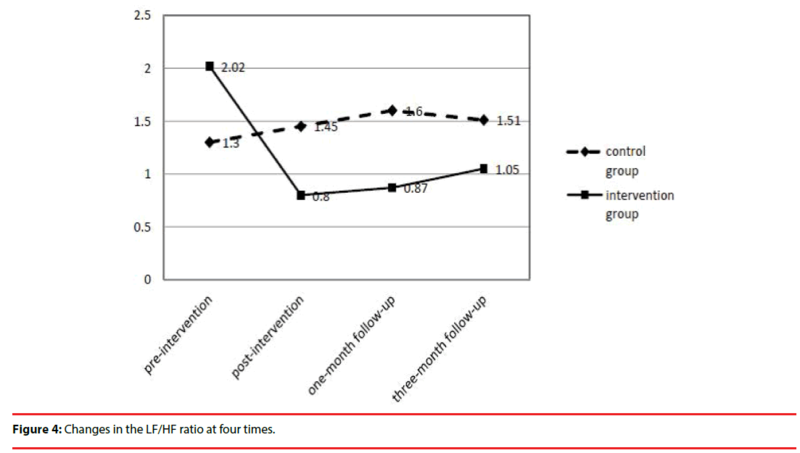 Data were collected by the blinded evaluator at four time points for both groups: before random assignment (pre-intervention), 4 weeks after completion of the intervention (postintervention), one-month follow-up, and threemonth follow-up. The patients were instructed to conceal their treatment allocation from the evaluator. The investigator also provided the evaluator with a training about how to use the measurements to collect data and instructing that the evaluator should not identify patient’s treatment allocation. The study was conducted from August 2013 to December 2014. The study conformed to the principles outlined in the Declaration of Helsinki and was approved by the Institutional Review Board of the participating hospital. Patients were recruited from the outpatient clinic of a universityaffiliated medical center in northern Taiwan. The inclusion criteria were: (1) age greater than 18, (2) diagnosed with heart failure, (3) without other life-threatening medical illnesses, cognitive impairment, or major psychiatric disorders, (4) not currently taking antidepressants, which may lower HRV, (5) capable of reading and understanding Chinese or Taiwanese, and (6) willing to participate in this study. The researchers explained the study purpose and procedure to the patients. The participants were enrolled in the study after providing written informed consent. The IG received EMDR intervention for 4 weeks. The CG received their usual care. The power for this study was calculated as 0.82, with medium effect size, an alpha level of .05, and sample size of 57. We collected participants’ demographic and clinical characteristic information through chart review and participant’s self-report. The data included age, gender, marital status, New York Heart Association [NYHA] classification, left ventricle ejection fraction (LVEF), clinical history, medication treatment, and number of years in heart failure. The Chinese version of the Beck Depression Inventory-II (BDI-II) was used to measure depressive symptoms. It is a 21-item selfadministered scale, which assesses affective, cognitive, and somatic symptoms of depression. Items are scored from 0 (not severe) to 3 (very severe). Higher scores indicate greater severity of depression. The scale has applicable construct validity and internal consistency reliability, with Cronbach’s alpha from 0.86 to 0.88 for psychiatric patients and 0.81for non-psychiatric patients . The Chinese version of the BDI-II had an acceptable Cronbach’s alpha of 0.95 for Taiwanese heart failure patients . We used the Chinese version of the Minnesota Living with Heart Failure Questionnaire (MLHFQ) to examine health-related QoL. MLHFQ is a self-rated disease-specific QoL instrument, which assesses patients’ perceptions of the impact of heart failure on their biopsycho- social domains of life. The questionnaire is comprised of 21 items scored from 0 to 5. The higher score indicates a poorer QoL . The Chinese version MLHFQ had adequate validity and reliability for Taiwanese heart failure patients [37,39]. Heart rate variability (HRV), a measure of the balance between sympathetic and parasympathetic mediators of heart rate, is quantified by time-domain and frequencydomain analyses. The frequency-domain measures of HRV include (1) total power, (2) low frequency band (LF), (3) high frequency band (HF), and (4) LF/HF ratio . A previous study identified a significant relationship between HRV parameters and BDI-II scores . In this study, we used LF, HF. and LF/HF ratio to represent the HRV parameters. LF reveals mixed sympathetic and parasympathetic activities; HF indicates parasympathetic activity; and high values of LF/HF ratio represent a dominance of sympathetic activity. Anxiety may activate a sympathetic response and cause an increase in heart rate, LF and LF/HF ratio . A CheckMyHeart device (DailyCare BioMedical, Chungli, Taiwan) was used to measure HRV. CheckMyHeart is a handheld limb-lead electrocardiogram recorder with HRV analytical software, which is CE (CONFORMITE EUROPEENNE) certified, and is not disrupted by electromagnetic interference. We instructed the participants to sit quietly to assure the quality of the recordings. We fixed the sensor on the radial area of participant’s forearm and recorded HRV for 5 minutes. The CheckMyHeart device has been used to measure HRV in previous studies [42-45]. The intervention consisted of four weekly sessions of EMDR, each lasting 60-90 minutes. A nurse practitioner trained in EMDR conducted the intervention in a room of the outpatient clinic. An 8-phase EMDR protocol was used, which consisted of the following phases: phase 1: history taking and treatment planning; phase 2: client preparation; phase 3: assessing target event; phase 4: desensitization phase; phase 5: installation of positive cognitive; phase 6: body scan; phase 7: debriefing; and phase 8: reevaluation . The process of EMDR began with the participants discussing their specific problem in a general way. Participants were instructed to imagine their most unpleasant experience of heart failure and form a mental picture of the event to create a meaningful target for desensitization. Positive beliefs and negative emotions were also identified. Then the participants focused on the images and thoughts, while simultaneously performing EMDR processing with bilateral stimulation, which involved moving their eyes alternately from side to side while following a moving object. After each stimulation session, participants rated their beliefs and emotions with the Validity of Cognition Scale (VOCS) and the Subjective Unit of Discomfort Scale (SUDS), respectively. The VOC is a 7-point scale, which participants used to rate their positive belief. The SUDS is a 10-point scale, which participants used to rate how strong they felt the negative emotions. Once the SUDS score reached 0 or 1, phase 4 ended. Phase 5 ended when the VOC score was 5 to 7. Data were analyzed with the Statistical Package for the Social Science (SPSS 20.0). Descriptive statistics (mean, standard deviation, frequency, and percentage) analyzed sample characteristics and outcome measures. Independent t-test and one-way ANOVA were conducted to examine the homogeneity of characteristics between the IG and CG. Generalized estimating equation (GEE) was used to examine the effects of EMDR on improving depressive symptoms, healthrelated QoL, and HRV. The significance (alpha) level was set at p < .05 with two-tailed analysis. A total of 57 heart failure patients participated in this study, 25 were in the IG and 32 were in the CG (Figure 1). Participants were 57.9% male (n = 33) and 42.1% female (n = 24). The mean age was 63.14±14.53 years. Most of the participants had NYHA class II (71.9%, n = 41) and 66.7% (n = 38) had a clinical history of hypertension. The mean LVEF was 49.86 ± 15.18%, and the mean of the number of years in heart failure was 4.53 ± 3.78 years. There were no significant differences in characteristics of the participants between two groups (Table 1). Abbreviations: ACEI, angiotensin converting enzyme inhibitor; ARB, angiotensin receptor blocker; CCB, calcium channel blocker; COPD, chronic obstructive pulmonary disease; HF, heart failure; LVEF, left ventricular ejection fraction; NYHA, New York Heart Association. Table 1: Demographic and clinical characteristics of participants. Figure 1: Enrolment and randomization of patients. We used GEE analysis to determine if there was an effect of EMDR on depressive symptoms. Compared to the CG, the mean scores of the BDI-II were reduced significantly more for the IG at post-intervention (χ2 = 15.7, p < .001), one-month follow-up (χ2 = 22.12, p< .001), and three-month follow-up (χ2 = 23.28, p < .001) (Table 2) (Figure 2). Our findings indicated the EMDR intervention resulted in a greater reduction in depressive symptoms compared with the CG. Abbreviations: EMDR, eye movement desensitization and reprocessing; GEE, Generalized Estimating Equation; BDI, Beck Depression Inventory; IG, Intervention group. Table 2: Effect of EMDR on depressive symptoms: GEE analysis of BDI-II scores (N = 57). 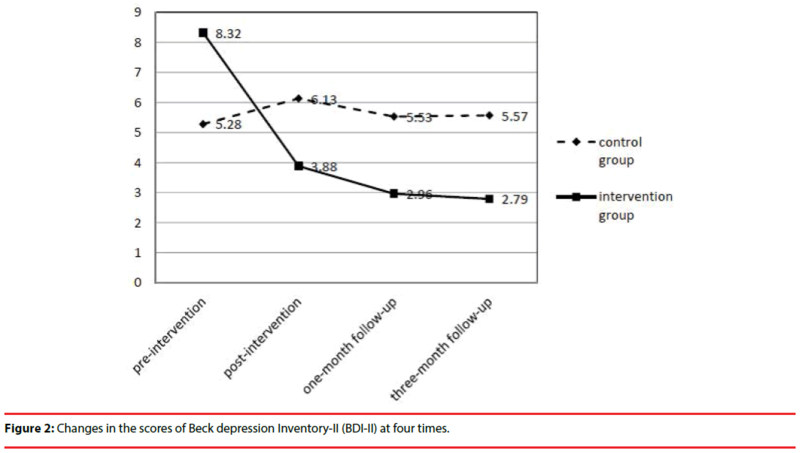 Figure 2: Changes in the scores of Beck depression Inventory-II (BDI-II) at four times. GEE analysis indicated health-related QoL significantly improved in the IG compared with CG. Mean scores of the MLHFQ were significantly decreased more in IG than in CG at post-intervention (χ2= 7.40, p= .007), onemonth follow-up (χ2= 7.96, p= .005), and threemonth follow-up (χ2= 4.01, p= .04) (Table 3 and Figure 3). These findings revealed that the participants in the EMDR IG perceived less impact of heart failure on their bio-psycho-social domains of life and had better health-related QoL than the participants in CG. Abbreviations: EMDR, eye movement desensitization and reprocessing; QoL, quality of life; GEE, Generalized Estimating Equation; MLHFQ, Minnesota Living with Heart Failure Questionnaire; IG, Intervention group. a Reference group: Control group. Table 3: Effect of EMDR on health-related QoL: GEE analysis of MLHFQ scores (N = 57). Figure 3: Changes in the scores of Minnesota Living with Heart failure Questionnaire (MLHFQ) at four times. According to GEE analysis, the participants in IG had a significant increase in HF at post-intervention (χ2 = 9.01, p = .003), onemonth follow-up (χ2 = 10.67, p = .001), and three-month follow-up (χ2= 3.95, p= .04), compared with CG. The participants in IG had a significantly greater decline in LF than the participants in CG at post-intervention (2 = 13.10, p < .001), one-month follow-up (χ2 = 13.21, p< .001), and three-month followup (χ2 = 3.47, p= .05). And the LF/HF ratio was also significantly decreased more for the IG at post-intervention (χ2 = 12.08, p = .001), one-month follow-up (χ2 = 14.11, p < .001), and three-month follow-up (χ2 = 6.02, p = .01), compared with CG (Table 4 and Figure 4). The findings indicated that EMDR may increase parasympathetic responses, and improve the balance between sympathetic and parasympathetic regulation. Abbreviations: EMDR, eye movement desensitization and reprocessing; HRV, heart rate variability; GEE, Generalized Estimating Equation; HF, high frequency; LF, low frequency; IG, Intervention group. Table 4: Effect of EMDR on HRV: GEE Analysis of HF, LF, LF/HF ratio (N = 57). Figure 4: Changes in the LF/HF ratio at four times. The primary findings of this study indicate that the EMDR intervention significantly improved heart failure patients’ depressive symptoms, health-related QoL, and HRV after four weeks of intervention. The effects were also sustained at 1-month and 3-month follow-up. The results suggest that an EMDR intervention has clinical benefits on decreasing depressive symptoms in patients with heart failure. The findings are consistent with the results of previous studies [26-32], which also recognized the effectiveness of EMDR on reducing depressive symptoms. Moreover, we found that the effects of EMDR on depressive symptoms were sustained at one month and three months after completion of the intervention. Several patients in our study expressed that after receiving EMDR they felt more peaceful and had better sleep quality. When they reflected on their health conditions, they had more positive and optimistic thoughts. The findings of this study revealed that patients receiving EMDR perceived less impact of heart failure on their bio-psycho-social spheres of life. Although there are no studies examining the effect of EMDR on QoL, several studies have identified the effectiveness of EMDR on improvement of the psychological well-being, particularly on PTSD , depression [26-32], and anxiety [25-27,30]. Previous studies also found that depression was a major factor negatively influencing QoL for heart failure patients [15-17]. Patients receiving EMDR in this study had a significant decrease in depressive symptoms and reported a reduction in distress from their heart failure conditions. Therefore, the patients perhaps had positive cognitive selfappraisals and experienced their life becoming better as a result. We also found that EMDR positively influenced HRV. Participants receiving EMDR had a significant increase in HF, and a decrease in LF and LF/HF ratio at post-intervention, onemonth, and three-month follow-up compared with controls. The findings indicate that EMDR increased parasympathetic responses, and improved balance between sympathetic and parasympathetic regulation. Previous studies also identified a similar effect of EMDR on HRV [33,34]. EMDR facilitates processing of memories of adverse life experiences and reduces negative emotions, physical sensations, and extreme arousal levels , which may increase the parasympathetic tone and improve the balance of autonomic activity. This study contributes to the literature by identifying the positive effects of EMDR for heart failure patients on improvements in depressive symptoms, QoL, and HRV. However, this study has some limitations. First, the intervention was conducted for only four weeks. Most participants had experienced multiple heart failure difficulties; however, they were only able to deal with one or two of the most distressing situations. Second, one expert supervised EMDR　intervention administered in this study, but similar supervision might not be available in clinical practice. Third, it was not possible to blind the researchers or the participants to the group assignments because the participants in the control group did not receive any sham intervention. The experimental condition was compared to a no treatment control condition. In the future study, it would be better to design a sham intervention to provide blind. Finally, because the study recruited subjects from one medical center, generalization of the results to a broader population of heart failure patients is limited. In conclusion, the findings of this study support our hypotheses regarding the impact of an EMDR intervention for heart failure patients on the decrease in depressive symptoms, and improvements in health-related QoL and HRV. The development of clinical guidelines for managing depressive symptoms in heart failure patients should consider employing EMDR, which could benefit individuals with severe emotional and psychological distress resulting from their diseases. This work was supported by a grant awarded (grant No. NSC 102-2314-B-016-003) from the Ministry of Science and Technology, Taiwan. The sponsor had no role in designing or conducting this research. Roger VL. Epidemiology of heart failure. Circ. Res 113(6), 646-659 (2013). Sakata Y, Shimokawa H. Epidemiology of heart failure in Asia. Circ. J 77(9), 2209-2217 (2013). Rutledge T, Reis VA, Linke S, et al. Depression in heart failure: A meta-analysis review of prevalence, intervention effects, and association with clinical outcomes. J. Am. Coll. Cardiol 48(8), 1527-1537 (2006). Lossnitzer N, Herzog W, Störk S, et al. Incidence rates and predictors of major and minor depression in patients with heart failure. Int. J. Cardiol 167(2), 502-507 (2013). Jaarsma T, Lesman-Leegte I, Hillege HL, et al. Depression and the usefulness of a disease management program in heart failure: insights from the COACH study. J. Am. Coll. Cardiol 55(17), 1837-1843 (2010). Alhurani AS, Dekker RL, Abed M A, et al. The association of co-morbid symptoms of depression and anxiety with all-cause mortality and cardiac rehospitalization in patients with heart failure. Psychosomatics 56(4), 371-380 (2015). Suzuki T, Shiga T, Kuwahara K, et al. Impact of clustered depressed and anxiety on mortality and rehospitalization in patients with heart failure. J. Cardiol 64(6), 456-462 (2014). Rollman BL, Belnap BH, Mazumdar S, et al. A positive 2-item patient health questionnaire depression screen among hospitalized heart failure patients is associated with elevated 12-month mortality. J. Card. Fail 18(3), 238-245 (2012). Jiang W, Krishnan R, Kuchibhatla M, et al. Characteristics of depression remission and its relation with cardiovascular outcome among patients with chronic heart failure (from the SADHART-CHF study). Am. J. Cardiol 107(4), 545-551 (2011). Sherwood A, Blumenthal JA, Hinderliter AL, et al. Worsening depressive symptoms are associated with adverse clinical outcomes in patients with heart failure. J. Am. Coll. Cardiol 57(4), 418-423 (2011). Jiang W, Kuchibhatla M, Clary GL, et al. Relationship between depressive symptoms and long-term mortality in patients with heart failure. Am. Heart. J 154(1), 102-108 (2007). Sherwood A, Blumenthal JA, Trivedi R, et al. Relationship of depression to death or hospitalization in patients with heart failure. Arch. Intern. Med 167(4), 367-373 (2007). Johnson TJ, Basu S, Pisani BA, et al. Depression predicts repeated heart failure hospitalizations. J. Card. Fail 18(3), 246-252 (2012). Maeda U, Shen BJ, Schwarz ER, et al. Self-efficacy mediates the associated of social support and depression with treatment adherence in heart failure patients. Int. J. Behav. Med 20(1), 88-96 (2013). Schowalter M, Gelbrich G, Störk S, et al. Generic and disease-specific health-related quality of life in patients with chronic systolic heart failure: impact of depression. Clin. Res. Cardiol 102(1), 269-278 (2013). Gottlieb SS, Kop WJ, Ellis SJ, et al. Relation of depression to severity of illness in heart failure (from Heart Failure and a Controlled Trial Investigating Outcomes of Exercise Training [HF-ACTION]). Am. J. Cardiol 103(9), 1285-1289 (2009). Hallas CN, Wray J, Andreou P, et al. Depression and perceptions about heart failure predict quality of life in patients with advanced heart failure. Heart. Lung, 40(2), 111-121 (2011). Celano CM, Huffman JC. Depression and cardiac disease: A review. Cardiol. Rev 19(3), 130-142 (2011). Nair N, Farmer C, Gongora E, et al. Commonality between depression and heart failure. Am. J. Cardiol 109(5), 768-772 (2012). Francis JL, Weinstein AA, Krantz DS, et al. Association between symptoms of depression and anxiety with heart rate variability in patients with implantable cardioverter defibrillators. Psychosom. Med 71(8), 821-827 (2009). Kao CW, Tseng LF, Lin WS, et al. Association of psychosocial factors and heart rate variability in heart failure patients. West. J. Nurs. Res 36(6), 769-787 (2014). Folino AF, Tokajuk B, Porta A, et al.Autonomic modulation and clinical outcome in patients with chronic heart failure. Int. J. Cardiol 100(2), 247-251 (2005). Shapiro F. Eye movement desensitization and reprocessing: basic principles, protocols, and procedures (Second Edition). London: The Guilford Press (2001). Lee CW, Cuijpers P. A meta-analysis of the contribution of eye movements in processing emotional memories. J. Behav. Ther. Exp. Psychiatry 44, 231-239 (2013). Rathschlag M, Memmert D. Reducing anxiety and enhancing physical performance by using an advanced version of EMDR: a pilot study. Brain. Behav 4(3), 348-355 (2014). Raboni MR, Alonso FF, Tufik S, et al. Improvement of mood and sleep alterations in posttraumatic stress disorder patients by eye movement desensitization and reprocessing. Front. Behav. Neurosci 8, 1-11 (2014). Babaei F, Fakhri MK, Zadeh AM. The impact of EMDR technique in reducing the symptoms of psychological illness of Sari’s veterans. J. Soc. Iss. Humanit 2, 115-119 (2014). Hase M, et al. Eye movement desensitization and reprocessing (EMDR) therapy in the treatment of depression: a matched pairs study in an inpatient setting. Brain. Behav 5(6), e00342 (2015). Hofmann A, et al. Eye movement desensitization and reprocessing as an adjunctive treatment of unipolar depression: a controlled study. J. EMDR. Pract. Res 8(3), 103-112 (2014). Chen YR, Hung KW, Tsai JC, et al. Efficacy of eye-movement desensitization and reprocessing for patient with posttraumatic-stress disorders: a meta-analysis of randomized controlled trials. PLoS ONE 9(8), e103676 (2014). Bae H, Kim D, Park YC. Eye movement desensitization and reprocessing for adolescent depression. Psychiatry. Investig 5(1), 60-65 (2008). Sack M, Lempa W, Steinmetz A, et al. Alterations in autonomic tone during trauma exposure using eye movement desensitization and reprocessing (EMDR): results of a preliminary investigation. J. Anxiety. Disord 22(7), 1264-1271 (2008). Elofsson UO, von Schéele B, Theorell T, et al. Physiological correlates of eye movement desensitization and reprocessing. J. Anxiety. Disord 22(4), 622-634 (2008). Woltz PC, Chapa DW, Friedmann E, et al. Effects of interventions on depression in heart failure: a systematic review. Heart. Lung 41(5), 469-483 (2012). Beck AT, Steer RA, Brown GK. BDI-II manual. San Antonio: The Psychological Corporation (1996). Kao CW, Chen TY, Cheng SM, et al. Gender difference in the predictors of depression among patients with heart failure. Eur. J. Cardiovasc. Nurs 13(4), 320-328 (2014). Riegel B, Moser DK, Glaser D, et al. The Minnesota Living with Heart Failure Questionnaire: sensitivity to differences and responsiveness to intervention intensity in a clinical population. Nurs. Res 51(4), 209-218 (2002). Ho CC, Clochesy JM, Madigan E, et al. Psychometric evaluation of the Chinese version of Minnesota Living with Heart Failure Questionnaire. Nurs. Res 56(6), 441-448 (2007). Bilchick KC, Berger RD. Heart rate variability. J. Cardiovasc. Electrophysio 17(6), 691-694 (2006). Kamath MV, Fallen EL. Power spectral analysis of heart rate variability: a noninvasive signature of cardiac autonomic function. Crit. Rev. Biomed. Eng 21(3), 245-311 (1993). Lee KC, Chao YH, Yiin JJ, et al. Effectiveness of different music-playing devices for reducing preoperative anxiety: a clinical control study. Int. J. Nurs. Stud 48(10), 1180-1187 (2011). Lee KC, Chao YH, Hsieh HY, et al. Evidence that music listening reduces preoperative patients’ anxiety. Biol. Res. Nurs 14(1), 78-84 (2012). Peng SM, Koo M, Yu ZR. Effects of music and essential oil inhalation on cardiac autonomic balance in healthy individual. J. Altern. Complement. Med 15(1), 53-57 (2009). Wen TL, Chung-Kwe W, Yang IF, et al. Relationship between electrolytes and heart rate variability parameters in end-stage renal failure patients before and after hemodialysis. Anadolu. Kardiyol. Derg 7(Suppl 1), 142-144 (2007). Shapiro F. The role of eye movement desensitization and reprocessing (EMDR) therapy in medicine: addressing the psychological and physical symptoms stemming from adverse life experiences. Perm. J 18(1), 71-77 (2014).